Tapestry weaving is my vehicle to investigate what it means to be a human being, influenced by the natural landscape and beauty of the earth. Weaving is one of those original crafts that has been practised by almost every culture on the planet. It is part of our basic human cultural inheritance and as such, touches a place of deep knowing in us all. The Mayans say that when a woman ties herself into her backstrap loom, she ties herself to the cosmos. The universe, they say, was woven into being. I have been weaving tapestries for 40 years. The longer I weave, the more weaving reveals of itself to me. The more I know it to be something very, very special – sacred, even. 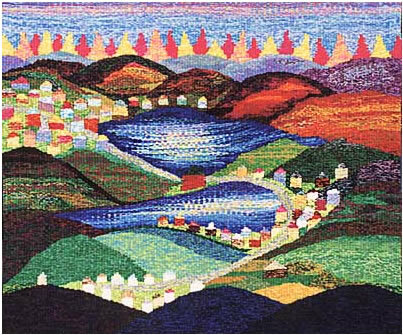 Community tapestry projects let the magic, mystery and beauty of weaving touch many people. My association with community tapestry projects began several years ago when Moon Rain Centre received a phone call from Christine Tremblay, executive director of Arts Ottawa East community arts council. And so began an inspiring journey directing community tapestry projects based on the model that Arts Ottawa East and Moon Rain Centre developed called “Weaving the Community Together”. Christine Tremblay felt very strongly that we needed to go to where the people are – which is in the shopping mall! I have to admit this was a total departure from Moon Rain Centre's secluded studio retreat space, located in the Gatineau Hills north of Ottawa, and from the tranquil exhibitions Moon Rain Centre has coordinated over the years. However, I had heard feminist artist Judy Chicago, in a lecture at the Banff Centre, say exactly the same thing. I knew it would be challenging on many levels, but I knew both women were absolutely right. I decided to base the design for the tapestry on patchwork, thinking that everyone who participated could weave a small “patch” or block of tapestry. It would be abstract. I felt that my job was to hold it together. I would demonstrate basic technique and then just let people weave. What I discovered was that people love to weave. Young, old, female, male, - everyone who approached the loom and came in contact with the yarns and the weaving seemed to be totally captivated by the process and the product. I soon realized that there’s a real need for creative outlets. More so, there is a huge hunger to be creative. Today’s societal and financial pressures allow very few people the luxury of creative play. And yet, it’s a very basic human need to use the hands, to make and to create. Once weaving, most people didn’t want to stop. Many people returned to the loom again and again during the following weeks in order to weave on the tapestry. Entire families came to weave, and people made friends weaving. The greatest challenge for me was to accept and work with an array of imperfections. Fortunately, Moon Rain Centre has a wonderful young project coordinator, Gabriel Ewen Phillips. Gabriel's lack of prejudices about what art “is” and what tapestry “is” and her abundance of lucid creativity provided a lot of teaching to me about “letting go”. This young and talented textile artist and clothing designer turned gaping slits into embroidered pathways, decorated notches and embellished gateways. Glitches simply became open invitations for decorative needlework. The tapestry grew and I grew along with it. This public art project gave everyone the opportunity to participate in the making of something uniquely beautiful. Finished it looks like a community with rooftops, parks and laneways, viewed from above. It is a wonderful mirror of the creativity of the more than 250 people who happily wove it. It is now permanently installed in the Shenkman Arts Centre where the offices of Arts Ottawa East are located. “Weaving the Community Together” proved to be a very real coming together of all the necessary components: the co-ordination, the artistic, and the community. Arts Ottawa East and Moon Rain Centre realized we had created a concept and a model for community tapestry projects, and a dynamic and interesting vehicle for integrating contemporary Canadian craft into the community. Two Rivers Gallery in Prince George, British Columbia invited Moon Rain Centre to design and direct a community tapestry project in collaboration with the B.C. Arts Council and Prince George Weavers and Spinners Guild. Two Rivers Gallery is the public art museum of Northern British Columbia. Moon Rain Centre was invited to design and direct a community tapestry project in conjunction with the exhibition, "Tapestries from Moon Rain". Tapestries, the loom, and baskets of yarns were packed, crated and shipped to British Columbia. The loom was specifically designed to be free-standing, portable, easily assembled and disassembled. In Prince George, we wove in four locations: the mall, the University of Northern British Columbia, Caledonia College, and in the Two Rivers Gallery. The Prince George Weavers and Spinners Guild partnered the project and are a wonderful and dedicated group. With this strong guild involvement and participation we were weaving with a good level of expertise. The Guild’s continuous participation weaving with the public provided a strong core to the project. I designed the tapestry to be the Prince George landscape with it’s two rivers, the Fraser and the Natchako, meeting and joining together, and the Rocky Mountains in the distance. The weavers co-created, working with the public and participating in all the decisions. It was a very positive experience for the Guild. Over 300 people of all ages and from all walks of life wove on the tapestry. Everyone identified with the image that was being woven and was thrilled to take part as the tapestry progressed. When the weaving was complete, the tapestry was cut off the loom and shipped back to Moon Rain Centre, where Gabriel and I did the finishing, blocking, lining and hanging. I remember opening the shipping crate and lifting out the tapestry, unwrapping and unrolling it in the studio. To my amazement it seemed as though love poured out of it, and I sat there basking in it, remembering the people and the process. I telephoned Two Rivers Gallery curator, Julia Whittaker in Prince George, who had been so supportive during the exhibition and project. We laughed together, sharing the understanding that it takes love to make art. It was only after the project was completed that I could finally stop and fully appreciate the strength and subtlety of everyone’s commitment to the tapestry, the Guild’s passion for weaving, and the bond that had been created. 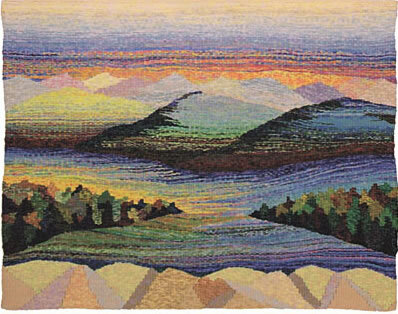 The finished tapestry, titled “Two Rivers” now hangs in the Gallery’s permanent collection, and has been loaned to the University of Northern British Columbia. The largest project, called “Tissons Val-des-Monts Tous Ensemble”, based on the model that Arts Ottawa East and Moon Rain Centre developed, was done in Val-des-Monts, Quebec, in the municipality where Moon Rain Centre is located. The title means, weaving Val-des-Monts all together. Val-des-Monts is an amalgamation of three small villages, each separated by mountains and lakes but joined by one road which winds its way through the municipality, connecting the villages. Each village has its own public school and its own small library. We transported the loom into the three schools, the three libraries and the municipal hall. We wanted to give everyone in the municipality the opportunity to co-create the tapestry. “Tissons Val-des-Monts tous ensemble” was a very wonderful weaving together of the creative energies of our community. It was a profound and powerful experience to join together with the children and adults of the community to weave a tapestry that expresses the collective love and respect for both the natural environment and the growing municipality. I was overwhelmed by the willingness of the school children to join in. They immediately took the project to heart and immersed themselves in the theme and in the weaving. Right from the beginning it was their tapestry, their work of art destined for their municipal building. It was real, concrete, and they just poured their energy into it. Such a beautiful spirit of openness, and willingness to share and to co-create was expressed by everyone who worked on the project. The co-ordination was done by the municipality’s Loisir et Culture, recreation and culture staff of two, who handled everything from flyer production and distribution to trucking the loom to the next weaving location. Viewing the tapestry is an act of geographical orientation for citizens young and old; it affirms community, it is completely recognizable. The project, �Tissons Val-des-Monts tous ensemble� created community. The finished tapestry is now permanently installed in the municipal council chambers and gives pride and delight to viewers. Over 900 people of all ages wove this tapestry, setting a North American record for participation in community tapestry projects. The total population of the municipality is 8,500. "To be an artist and to direct a community tapestry project is like being intimately involved with a river - a fast flowing river. It takes a lot of energy and gives a lot of energy and it's always moving. It is a very profound experience. The best part is that it enriches and rewards everyone, and fills this huge hunger that I sense everyone shares to be creative and to participate in beauty." The “Weaving the Community Together” concept developed by Arts Ottawa East and Moon Rain Centre has touched many thousands of people in just a few years, permitting community participation in the making of their own public art. The very favourable and encouraging public and media response to these projects is awakening a new awareness of contemporary weaving as public art. Weaving is a contemporary creative vehicle for community building. 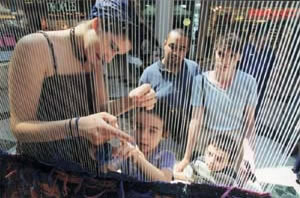 Weaving is a contemporary creative vehicle for community building.